It seems that each specific Root Level emanates a specific Primary Hierarchy i.e. RL1-Action emanates PH1-Action, RL2-Inquiry emanates PH2-Inquiry, and so on until RL7-Willingness emanates PH7-Willingness—as shown in the above diagram). But it is now proposed that all Root Levels necessarily contribute to each Primary Hierarchy as shown in the diagram below. This necessary contribution is the «Root Projection». What it means in practice is that the particular Root Level functioning is intrinsic to the function of the corresponding level in the Primary Hierarchy. Close inspection of each Primary Hierarchy level in terms of its function generates the question "how could you [perform that function] without the [Root Element]? "—and the answer that you give is: "you couldn't!". In what follows, all 49 levels (elements, processes, functions) in the 7 Primary Hierarchies will be examined. Take each Primary Hierarchy in turn: 7 sets of L1 to L7. Take all L7's, then all L6's, then all L5's .... through to all L1's. I intend to proceed using the 2nd method, because the focus here is on the Root projection primarily. As always names are potentially misleading. Any THEE level is not determined by the name but by its practical function in psychosocial endeavours. The biggest potential for misunderstanding involves leaving this sphere, and attempting to reflect and reason using the name with an inappropriate meaning or perspective. A key feature of this investigation has been the necessity to distinguish the «entity name» and «function name» for a particular Primary Hierarchy Level. See more details with examples of recently revised formulations. Taxonomic elements are processes and the function of a taxonomic element is the essence of that element manifesting in practice. The propositions are phrased as they are so as to avoid confusion from associating automatically to the name assigned to a Level rather than focusing on its function. The function of all Level-1 elements in Primary Hierarchies necessarily involves Action-RL1. Explore. The function of all Level-2 elements in Primary Hierarchies necessarily involves Inquiry-RL2. Explore. 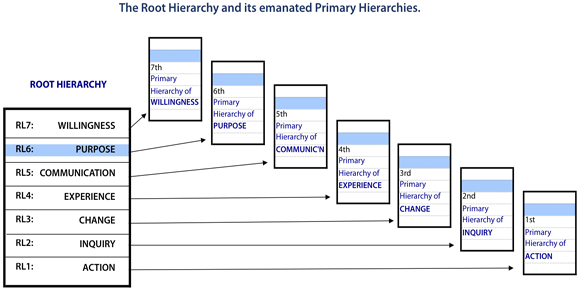 The function of all Level-3 elements in Primary Hierarchies necessarily involves Change-RL3. Explore. The function of all Level-4 elements in Primary Hierarchies necessarily involves Experience-RL4. Explore. The function of all Level-5 elements in Primary Hierarchies necessarily involves Communication-RL5. Explore. The function of all Level-6 elements in Primary Hierarchies necessarily involves Purpose-RL6. Explore. The function of all Level-7 elements in Primary Hierarchies necessarily involves Willingness-RL7. Explore. Review previous attributes of levels from previous work. Review the complete findings and explore further.